It tries a little too hard at times but the XW-P1 rewards your patience with some great features. Solo synth mode is versatile and infinite in its sonic potential. Workstation features at a competitive price. Sliders for control over parts, organ drawbars and flexible 'Hex Layers'. Editing patches can be tricky. Presets can be uninspiring. The NAMM show in January is always a gauge of the year to come within the music tech industry. You can always find products and stories to pique a range of interests. Among those from the 2012 show, almost a year ago, was Casio's announcement that it was releasing new pro synthesizers, almost 30 years after the highly-regarded CZ series instruments made their debut. Now, over 11 months later, the XWP1 is here alongside its brother, the XW-G1 'Groove Synth'. Indeed, the review unit is one of 200 Limited Edition models rendered in gold. By any standards it's a bold colour choice but it does beg the question - does the capability of the synth match its shiny personality? The somewhat wordy tag line for the XW-P1 - 'Hybrid Processing Sound Source' - is certainly worthy of some further explanation. Put simply, the XW-P1 is capable of producing sounds in a range of different ways, namely as a 'PCM' synth with a generous onboard library of 'stock' sounds, as a Drawbar Organ, as a Solo Synth and as a player of Casio's own 'Hex Layers', of which more shortly. The PCM sounds are solid enough, offering sounds under dedicated Piano, Strings/Brass, Guitar/Bass, Synth and Various (including drum kits) buttons to access the relevant categories. Once you've found a sound you like, you can edit it, with control over extended parameters available from the LCD menu of which four can be controlled from the K1-4 Assignable Knobs in the top-left hand corner. There are 400 PCM preset sounds onboard, with space for 100 User programs of your making. The Drawbar Organ option offers 50 presets with a further 50 spaces for your own variations and while it's common to find 'performance' synths now offering some Organ control, not many take this process as seriously as Casio have. Above the Pitch Bend and Modulation wheels, you'll find 8 'Drawbar sliders', as well as additional controls for Organ parameters including Rotary speed. The sliders make careful creation of modelled organ sounds really fun and intuitive though, as we'll see shortly, their capabilities stretch further than Drawbar control alone. Which brings us neatly to the XW-P1's most unique sonic category, the Hex Layer. This is a single tone with six independently adjustable components. Each component layer features its own filter, pitch data (for transposition offsets), envelope data, key splits, velocity range and effects mix, with balances between each part assigned to the sliders. The first six of these control the levels of each layer, the seventh acting as a 'Total' control for the six combined. Finally, the 8th and 'Master' sliders control Effects parameters. The final sound type is Solo Synth but, again, there are unexpected twists in the sound design here. A Solo Synth patch can actually feature six separate sound sources or 'Blocks', namely two 'virtual analogue' Oscillators (Blocks 1 and 2), two sampled PCM ones (Blocks 3 and 4), an external signal (Block 5) routed in from the back panel inputs and a Noise generator (Block 6). Again, all of these can be balanced by the sliders, but what's pleasing here is the sheer array of starting points available for both the Synth Oscillator and PCM stages. No fewer than 310 Synth Waves are available for Blocks 1 and 2, while the PCM Wave List runs to a staggering 2,157 options! You might think that, with this much choice, each sound source would be governed by global routing thereafter but even this isn't true; each Block, including the External signal, features its own Filter and Amplifier modules, before global LFO control and 'Total Block' (combined) editing of a further Filter and Effects module lie in wait. This is, without question, the XW-P1's ace in the hole and, while the keyboard's feature set extends way beyond the Solo Synth section, the sonic potential of this part alone is vast. 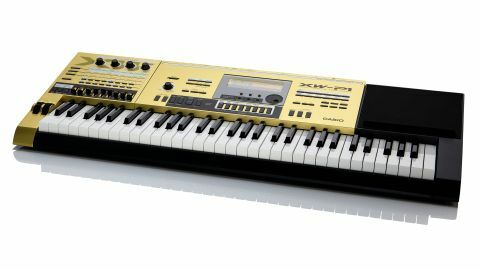 Beyond that, the XW-P1 offers a range of features which push it firmly towards the 'workstation' territory, hinted at by the busy back panel, which offers Microphone Input (with gain dial), stereo Audio Ins, Instrument Inputs, a USB port and an SD card slot alongside stereo audio outs and MIDI ports. The 20 Preset Drum kits are put to good use within the onboard sequencer - as with other contemporary workstations, the Performance Presets have been tailored to ensure that a stylistically-relevant drum groove will be triggered for each program. Indeed, the keyboard is 16-part multitimbral and, while you'll find the polyphony - capped at 64 voices - limiting if you are intending to carry out extensive sequencing here, it should prove useful as a musical sketchpad for ideas. Add in Phrase and Step Sequencing and the built-in Arpeggiator and you begin to get a sense of how hard the XW-P1 tries to be all things to all-comers. Perhaps this last point represents its Achilles' heel, as while some features are really intuitive, others are much less so. Editing sounds, particularly the six sources of a Solo Synth patch could be much simpler than the series of button presses currently required and it's definitely fair to say that scrolling through the presets too often offers an uninspiring insight into the synth's capabilities. On one level this doesn't matter as users will soon look beyond the presets but, as User locations for patches stored onboard is fairly limited, this is a consideration, though further sounds and sequences can be stored to an SD card. There's no doubt that this is a competitively-priced, feature-packed instrument and, once you've drilled down through its surface, you'll find that many of its features reward your sonic experiments.